I don’t remember when or why I bought this book, I do know why I read it, I was desperate to post that I had read a book in 2013 and I knew it was a quick read. I was not prepared to like this book, certainly not as much as I did. As I said, it was a quick read, it’s written for children, a little scary but some children like to be scared. Coraline is a little girl who does what she needs to do even when she is scared. 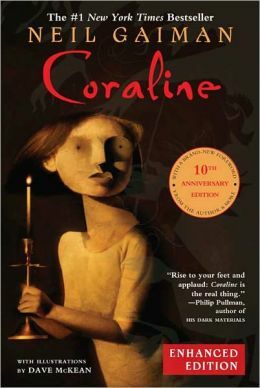 What I liked was that even though her parents may not have played with her as much as she wanted, and even though her mother wouldn’t buy her lime green boots, they were not neglectful and they did love Coraline. More than that would give stuff away. So that is all I am saying. Posted by Belleza on January 29, 2013 in 2013, Children's book, Fantasy, Fiction and tagged eBooks, iBooks, Liked it ♥♡, My book, Neil Gaiman, Recommended to read.